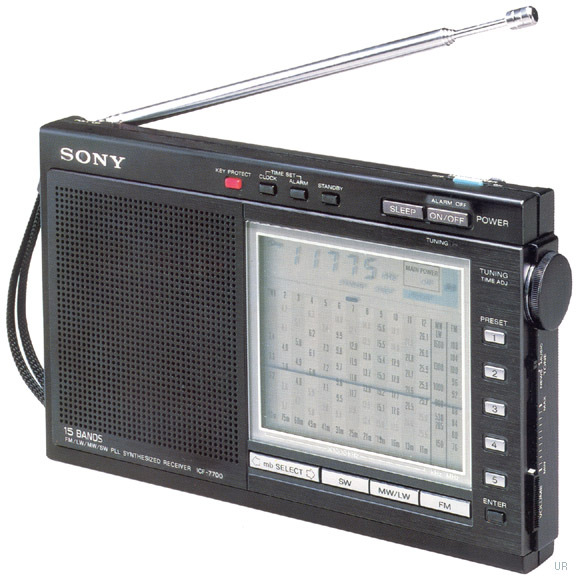 The Sony ICF-7700 is a compact 15 band portable with rotary tuning, and both analog and digital displays. There are 15 memories (5 for FM, 5 for LW/MW and 5 for SW). Frequency coverage is: 150-285 kHz LW, 530-1700 kHz MW and 76-108 MHZ FM. The 12 most popular shortwave broadcast bands are also featured: 3050-3565, 3700-4215, 4650-5165, 5800-6315, 6950-7465, 9375-10010, 11525-12160, 13375-14010, 14975-15610, 17475-18110, 21352-21960 and 25475-26100 kHz. Bands can be can be selected via electronic feather-touch buttons. The dual conversion circuit also includes a two position tone control. The built in clock-timer features a 65 minute sleep timer. 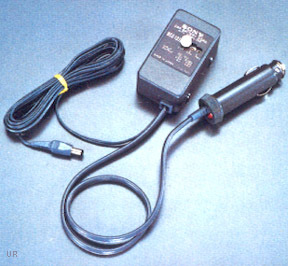 There is also a lock button on the front and a 9/10 kHz MW step switch in the battery compartment. 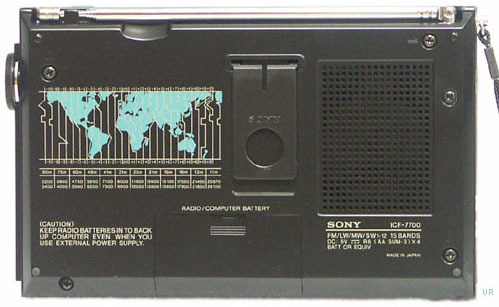 There is a flip-stand on the back panel. The left side has jacks for earphone output, record output and 6 VDC input. A wind-up wire antenna is included. Copyright 2005-2016 Universal Radio, Inc.